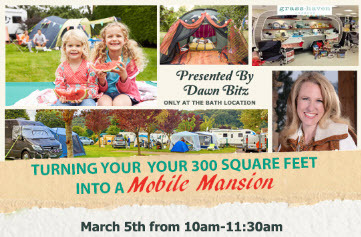 Join us on March 5, from 10-11:30 a.m., for a glamping seminar with Dawn Bitz from Grasshaven. Dawn will discuss in her usual style and wit how to make your 300 square foot space feel like a mansion through simple organization, decorating and ingenuity. Whether you’re new to RVing, thinking of hitting the road full-time or want to downsize from one RV to another, this seminar will help you understand how to make your RV feel like home. In addition to teaching you how to take your RV from drab to fab, Dawn will be consulting on an individual basis on RV storage. Bring a picture of your space and she will help you find storage solutions that are creative and attractive for both the inside and outside of your RV. If one of your biggest concerns is how to make your RV seem bigger, Dawn will provide additional tips beyond the old mirror trick. Oftentimes RVers face decorating challenges that are different that what they would encounter at home. Dawn will discuss how to tackle and approach these issues, so your space can look it’s best. Not quite sure what to ask. Join us for the open forum Q&A session, where you will hear other RVers ask questions and perhaps be inspired by a few of your own! Register for this FREE seminar today and be sure to share it with your friends so they can get in on the fun.